Yes it's true. I blog when I am stressed. Better than eating all the left-over curry which was my initial plan. Or bugging Christopher (who admitted, upon waking up and reading my previous post, that he doesn't really know that my mother is male) who is in the next room working on his FLASH! Here is a FLASH! for you. I am finding that I have strange attractions to people lately. You know what I am talking about right? And Steve mentioned this incident. Speaking of FLASH! That smile! Wow! That smile! And here is the kicker in the pants....I just read that he is only 45 short minutes away at that Sundance Film Festival that everyone keeps talking about. How do you think I am supposed to get anything done around here knowing that Mr. FLASH! Smile is so close? 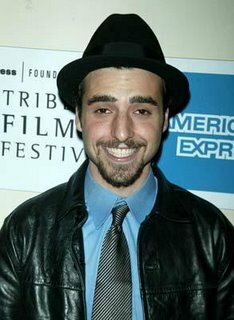 and see if Mr. David Krumholtz is strangely attracted to me too. P.S. I turned my comments on. Please post your strange crush. Make me feel apart of the human race again.